Wheeler would start the game off by giving up a lead off homerun to Anthony Rizzo. Yes, the Cubs 1st baseman Anthony Rizzo for some reason is leading off games for Maddon & the Cubs. Wheeler would strike out the next three batters, putting the inning to an end. The Mets worked Lester hard in the bottom of the first. After Juan Lagares singled & scored off of a Yoenis Cespedes double, Neil Walker forced a full count before being walked & putting runners on first & second. Lester would then put Duda down on three on pitches, however it would take him 23 throughout the whole inning. Wheeler would start the inning off by getting Addison Russell to line out sharply to Neil Walker at second. Kyle Schwarber then would induced a walk before Wheeler was able to get Wilson Contreras to ground into a force out to cut down Schwarber at second base. Lester would then surprisingly hit an opposite field single before Albert Almora Jr. would also be walked to load the bases for Anthony Rizzo. Wheeler would push the count full to Rizzo with two out, meaning the runners would be in motion. However, after fouling off a few pitches, Rizzo would take a 3-2 slider below the knees to force in a run. On the first pitch of the next at-bat, Wheeler would give up his second grand slam of the season to Cubs second baseman, Ian Happ. This would extend the Cubs lead to 6-1 in just the top of the second. Bryant would then drop a single in centerfield to keep the inning going & then stole second base before Heyward would ground to a diving Reyes for an infield single. After the 46th pitch of the inning, Addison Russell, who also lead the inning off, hit a 2-out 2-run double to chase Zack Wheeler out of the game after only going 1 2/3’s innings, the shortest outing of his career. Josh Smoker would come on to strike Schwarber out but not before the Cubs would make it an 8-1 game. After a few homers from the Cubs, the Mets finally scored again with a homerun of their own. This one coming off the bat of Neil Walker. Lucas Duda would follow Walker with back to back shots, this being Duda’s 11th homerun of the season before the Mets would fall to the Cubs in a 14-3 game. Cespedes goes down as my player of the game by going 2-2 while driving in a run. He would eventually get lifted for Granderson in favor of the Cubs blowout lead. Terry Collins would make the smart move to take him out of the game while he’s still nursing a leg injury. Neil Ramirez also deserves a nod by going out there & pitching 2 1/3’s & striking out four while also bringing his season ERA to 6.75 in 22.2 innings. 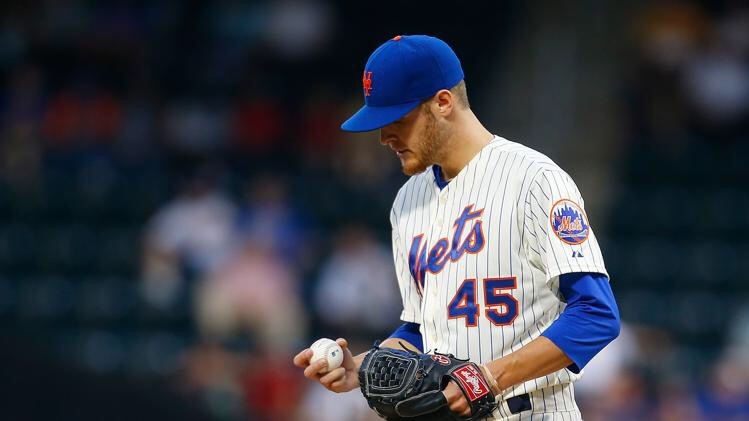 The Mets will send Harvey to the mound tomorrow in efforts to take the series from the Cubs.